The Rabbi with a Blog (Rabbi Jason Miller): Is Football for Jewish Kids? Is Football for Jewish Kids? I often joke that the point of a bar mitzvah is to celebrate the Jewish boy's realization that he'll have a much better chance of owning the professional team than playing on it. It's tongue-in-cheek humor, but the fact remains that there are many more Jewish professional sports team owners than Jewish players. In Detroit, it might be more accurate to say that Jewish boys who want to play pro sports grow up to be sports reporters on the evening news. Growing up in Detroit, the sports directors of all three major local networks were Jewish men. Eli Zaret on CBS-2, Bernie Smilovitz on NBC-4 and Don Shane on ABC-7. Eli Zaret is now a reporter for the Detroit Pistons. Bernie left Detroit for New York in the mid-90s only to return two years later. And Don Shane came to Channel 7 in 1989 and never left. 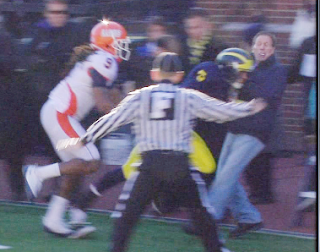 I was thinking about the stereotype that Jewish boys don't play football last night as I watched the late-night news broadcast on Detroit's ABC affiliate as they replayed Don getting tackled on the sidelines by University of Michigan quarterback Tate Forcier in yesterday's U-M win. I got to know Don pretty well in the early 90's when I was a babysitter for his two children. Don lives across the street from my uncle and aunt, and in high school I would play basketball with the guys in that neighborhood at my Uncle's house, including Don, on Saturday afternoons. Later that night, I would babysit for my cousins or Don's kids. I loved talking sports with Don because he not only knew everything there was to know about local Detroit sports, he was often the first to know. In all fairness to Don, the hard hit he took on the sidelines yesterday as he prepared his post-game report had nothing to do with whether Jewish boys play football or not. He was standing innocently on the sidelines when Forcier was forced out of bounds and was pushed directly into him. He suffered a split lip that required four stitches and a pretty nasty headache (reports confirmed it wasn't a concussion). Impressively, Don managed to conduct his post-game interviews and even shared some laughs with Forcier. So, even for those Jewish boys who make the conscious decision to become a sportscaster instead of a football player, remember that sometimes reporting from the sidelines can be a full-contact sport too. And while I never played high school football (although as a 6-foot-3, 220 pound guy I was desperately recruited each year by the coach), I am impressed by this all-Jewish San Diego high school football team making headlines. The JTA article about this Jewish day school's football team includes this great question: "Was the stereotype of the Jewish mom or dad, too fearful of their child getting hurt to let them go out for football, turning end over end on its way out of bounds?" Maybe a few of these Jewish kids will forgo a career as the team owner or sports broadcaster and actually wear a uniform for a pro team some day. SO ironic that you posted this. After I watched the football player (Collier?) carried off the field today, I announced to my boys that they would NOT be playing tackle football. And also coincidentally, I asked Benji today if he plans to be a sports journalist, since he's constantly feeding me sports scores (unsolicited, since I really don't follow sports). I was slightly horrified at how ignorant my boys are (though they are only 11 and 9) to the dangers of football (they're obsessed with the sport). When the player was injured today, Jeremy casually told me, it's 'only a concussion, probably'. When I told him that players have been paralyzed from football injuries, he informed me that I was wrong! Howard, being the sports go-to person in the family, immediately corrected Jeremy and gave him examples of players who've been injured or killed playing football. Rabbi Miller: so I guess the Countless Jewish Football Players,coaches, and personnel men who helped shaped the game as it is today simply mean nothing to the sport? the Most severe injury this Jewish-American ever got was on October 29th 1983 during Operation Urgent Fury(Grenada) when the MH-60 Blackhawk Helicopter I was Piloting was shot down and crash- landed into a tree, effectively ending my chance to come home and resume my athletic career in football as a player, so i became a coach and teacher instead. I hope you will let your sons continue to love the Great Game of Football. However, if you son is interested in a career in sports journalism, I can always use a few good interns! In fact, when i returned home from the Army In 1984 still on crutches, i attended a Catholic University(Fordham) because it was close to where i lived in the bronx(NYC) and the sports Broadcasting program was led by none other then the greatest voice in the history of NY sports-Marty Glickman who after WWII was a NY Giants Wide receiver for 7 years before becoming a Broadcaster. He also was denied the chance to compete as a track and field star in the 1936 Olympics because,..they were held in Berlin Germany. The 160th Special Operations Aviation Regiment(S.O.A.R. Even a serious tackling from the sidelines doesn't do as much brain damage as repeated small head injuries. There was an article studying this recently - even high school footballers apparently have a higher rate of early onset senility and blackouts, not to mention aggression and other trauma-related behaviors. Speaking of karate, Seth Rogen demonstrated his tough guy bona fides last night on the first episode of "Conan" by telling the viewing audience that he took karate at the Vancouver Jewish Community Center (JCC). Football is certainly for me, and I am Jewish.